It’s now easier than ever to disconnect from the modern world thanks to this box created to block out cellular signals. In today’s digital world, disconnecting from distractions is a challenge most individuals can’t overcome. Cell phones are a staple of modern life and for many not having their phone with them is like being naked. 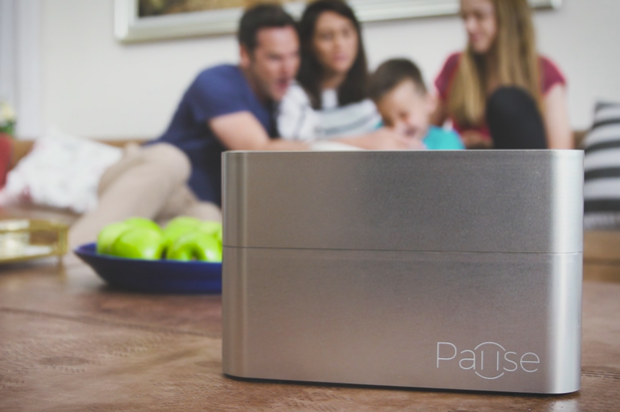 Pause is a device designed to make it easier for individuals to disconnect from the digital world in only a few steps. As the name implies, it’s a container which helps users “pause” their daily routines by giving up their cell phones for an extended amount of time by placing it in a signal blocking box. To use Pause, users open the lid, insert their phone, and replace the lid. From there, the phones are out of sight and out of mind. The main features of the box are that it blocks Wi-Fi, requires no batteries, and has no required setup or installation steps. Each box holds up to six phones. In addition to developing the box, the makers of Pause created a non-competitive game called “Just Share.” It consists of 12 cards that contain conversation starters. Although the game is recommended for parents and children ages 5-12, it still can be played by children of all ages. Now, you’re probably thinking, “Can’t I just use airplane mode to reduce distractions?” Per the campaign Indiegogo page, the makers encourage users to do so, but they claim most people never do. The designers maintain the box is more than a gimmick because the prescience of the device helps remind users to put their phones away. Pause weighs 1.1kg/2.5lbs and is 17cm x 5.5 cm x 27 cm (or 6.7” x 10.6” x 2.2”). As far as safety goes, the box is designed to minimize radiation emitted from the device based on the “Faraday Cage Concept.” This means that in addition to locking radiation inside the box, the radiation is converted to electrical waves as it passes through. According to the makers of Pause, the device doesn’t drain device batteries. Rather devices inside the box behave as they normally would in low reception areas. Pause raised over $16,000 towards their $36,000 goal via Indiegogo. The early bird edition of the box sold for $39 plus shipping, which is 33% off the retail price. There was also a family pack which includes a Pause box, hourglass, and a “just Share” card deck. This bundle sold for $65. The devices’ tops come in pinewood, red, cream, or blue. Yes, so great you can make your phone on airplane mode and put it in your closet smarttt idea! Yay! Family time is back to “family” time again! Even though airplane mode can remove distractions ON the phone, it does not remove the PHONE as a distraction. The Pause box does exactly that. Family time is more important than ever before. This box makes that just a little more enjoyable. I love it and cannot wait to see it for the first time in a restaurant. As sad as it might seem, there is always a lot of talk about putting the phone aside when you want to enjoy some family time. This box makes it easier to do so. I like it and am going to look into backing the project.